I admire writers who sharpen a tiny piece of a well-known historical event into a chisel, cracking open a hidden story with skill and precision. Jennifer Robson’s The Gown is an impressive example of that method. The basic story involves two women who work for Norman Hartnell, a famous English fashion designer in post-World War II. His top-tier clients included the royal family and when Princess Elizabeth becomes engaged in 1947, she chooses Hartnell’s dress design. The news electrifies the workers at the prestigious Hartnell shop in London. Two women will handle the rich embroidery that will ornament the dress and train. Ann, an English girl from nearby Barking and Miriam, a French war refugee with many secrets, move in with each other to share expenses, becoming fast friends. Most people who know me will be quick to point out that I’m not well-versed in fashion of any sort, royal wedding dresses least of all. But one of the many rewards of good fiction is the way it uses a compelling story to reveal fascinating details of a new topic for the reader. I won’t go into any of the details about how embroidery and dress-making work, but it’s a fun read. At some point, a third person enters the story. Heather lives in Toronto in 2016, and it’s a little while before we learn that Ann is her grandmother, who dies just as we meet Heather. Back in post-war London, two men complicate the plot, and the lives of Ann and Miriam, and both radiate with menace beneath a veneer of civility and charm. It’s no surprise when the mask falls from one, yet the other rewards us with a tidy love story. I recommend The Gown for a journey through this largely-unexplored world, a story of hardship and redemption that even takes us inside Buckingham Palace. I don’t find politicians and their families very interesting, even if I support their policies. I usually resist reading autobiographies and memoirs, preferring the seemingly-detached gaze of the historian or journalist. Few people are capable of rising above their own egos to offer a dispassionate look at their lives and I have little interest in reading justifications, no matter how much I admire and respect the person. I bought Michelle Obama’s book as a message of solidarity, a way to strike back at the disrespect and contempt she and President Obama endured while in the White House. I formed a vague impression of an accomplished, thoroughly decent couple but never invested much effort in learning about their personal lives. I wasn’t sure which of their daughters was Malia or Sasha until I read Becoming. After downloading the book to my e-reader, I kept seeing the cover while I selected other reads. The photo is arresting, both minimalist and lavish. Her smile, her pose, and her hair make an exuberant, poised statement. It intrigued me until I decided to give it a try. I’m glad I did. While I feared a detailed, heavy exploration of her life before the White House, she skimmed the details to harvest the important points such as her father’s stoicism, never missing a day of work as MS tore his body apart. She glides past the first boyfriends and offers flashes of her extensive family, just enough to give us the feel of their boisterous spirit and a few brooding individuals. Her mother stands out as a driven and supportive influence. I laughed out loud at a few statements I heard in my own mom’s voice and recognized the way Marian Robinson’s uncompromising expectation for excellence grew not just from love, but also unsentimental wisdom. I knew Michelle Obama built an impressive Ivy League academic profile (Princeton and Harvard!) but I didn’t realize her first job landed her in a Chicago skyscraper with her own office, earning a salary in the 1980’s that is enviable even today. It was also great fun when a guy named Barrack showed up in her office one day, as a possible future hire at the blue-chip law firm. 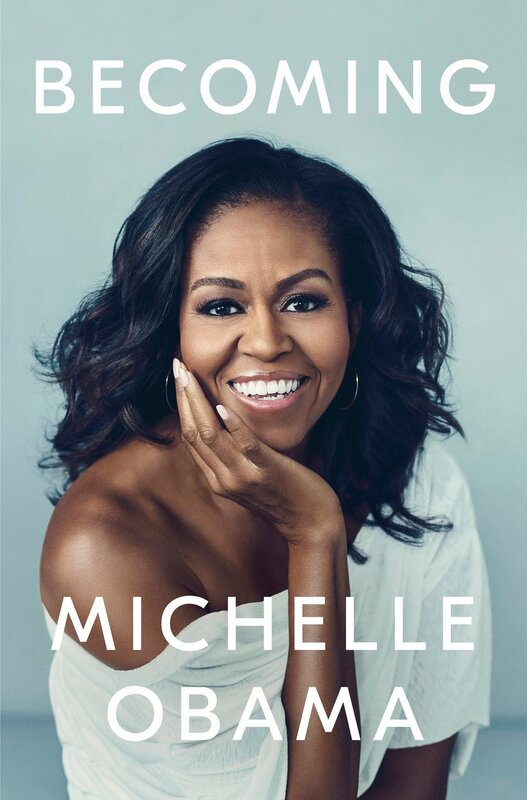 The next few years pass quickly across the pages, as a love affair becomes a marriage and Michelle Obama realizes that landing a big, splashy job was an understandable but misguided goal for someone of her temperament. She and her husband seek new ways to help the community, all while having two daughters and living a rushed family life many people will recognize. The campaign and election in 2008 are thrilling rides. After spending so much time with a young Michelle in Chicago, it’s easy to share the excitement of moving into the White House, traveling the world, and setting goals as First Lady. It’s an intimate, fun, and dizzying story that lets us glimpse the enchanted course her life took, including her friendship with Queen Elizabeth. Of course, the story comes with the dispiriting racist reality the Obamas faced and I’m glad she didn’t avoid it for the sake of expediency. It’s hard not to wince as the 2016 election looms, and Obama deals frankly and honestly about her feelings and the body-slam so many of us felt. She doesn’t say it outright, but I couldn’t help but re-live the sickening disbelief that people of such impeccable moral fiber were followed by…oh, hell I’ll let her speak for herself. I recommend Becoming as a fascinating glimpse into the life and thoughts of a dynamic woman who has a lot of wisdom and insight to share. Any reunion story is ripe for lots of drama, but in The Reunion, Michael James Grant milks it for all it is worth. Here’s the basic plot: Stone Grey, a writer living in San Francisco with his brother, returns to his small, coastal Maine town for his 20th high school reunion. While there is the usual complement of jealousies, unresolved conflicts and lust both fulfilled and unrequited, this gathering takes a quick detour to murder and it isn’t long before Stone is neck deep in a mystery that stretches back to his childhood. Ocean’s Harbor is a quaint spot, but seems filled with the sort of deranged and dangerous people who tend to stand out against such a picturesque backdrop. In the midst of all the joshing and reminiscing, we get flashes of what is to come by what has happened in the past: unsolved murders, mysterious attacks and dark secrets along isolated roads. Slowly, the story twists along a satisfying path that leads us to the present, where curiosity and questions lead to more murder. Before we know what’s happening, Stone is strapped into a roller coaster of a story that tears along to a violent denouement. Small town secrets are fine plot devices, and Grant delivers them in abundance. From fumbling high school gropes on the nighttime beach to resentful relatives and corrupt cops, we get an impressive array of turning points that lead the story into interesting places. And while it all felt complete in the end, I didn’t see the answer coming – not an easy feat within the confines of a small town. Grant is a fine writer with a style that often feels like a splash of water – descriptions and dialogue often strike unexpectedly and can be quite fun, but the sheer number of characters is somewhat overwhelming and now and again the story felt in need of a firmer grip. Even still, I ripped through the book in two readings and enjoyed every moment. If you ever saw the movie Beautiful Thing, you might remember that feeling of delight in seeing a first love, coming-of-age tale told from the perspective of gay teens. Now, in the age of Glee and many other stories, this genre like all others can start to feel weighted down by formulaic and standard tropes. In his novel Every Time I Think of You, Jim Provenzano breaks some molds and gives us a satisfying read that takes us in new directions. The story introduces Reid and Everett, two young men who hail from different parts of the same Pennsylvania town, in a chilly encounter in the snow. While out in the elements of winter, the boys heat up a private grove of trees with the sort of first encounter that most gay men will recognize – and that also illustrates the old saw that straight people should never ask a gay couple the circumstances of their first meeting. The encounter sets in motion all the elements of a first-rate love story – the clash of economic and cultural hierarchies; the tension of family dynamics; the dizzying swirl of falling in love. While Reid is the only son of a middle class, suburban family, Everett boasts the pedigree of town founders – the sort of family that inaugurated posh local events like the Spring Fling, and whose surname graces whole areas of the city. Reid might have enjoyed the benevolence of the local Country Club that allowed children from the other side of town to enjoy the snowy hills of the golf course during winter, but Everett hails from a family who shooed those same children from the premises when golf beckoned for the wealthier families in the warmer seasons. All the same, Reid’s family is the one most readers will appreciate and identify with, and his parents display a charming, eccentric sensibility. Everett’s family, meanwhile, is strewn across an emotional terrain scattered with distrust and conflict, all kept tightly bound by acceptable public manners. Just as the story feels as if it is nearing the expected denouement, a sports accident shatters the effortless arc, and the characters reel off onto trajectories of remorse, rage and uncertainty. The questions become far more complex, and the answers more remote. There’s a technicolor feel to this book, a glossy sheen of hope that sometimes shines with a glare that obscures the more desperate world of gay kids at the time and place in which these events take place – the late 1970’s in America’s Midwest. I grew up at the same time, not far from where these characters live, in a town that was culturally indistinguishable. Reading the story, there were times when I wondered if such an array of people (almost all of the parents, a sister, a peer, a counselor and a wheelchair-bound friend) would display attitudes that felt more contemporary. While this dissonance sometimes intruded, the story sailed along without pause for me, a pace set by writing appropriately honored with a Lambda Literary Award. In the end, Provenzano carries the reader along by the collar, creating a love story that veers in unexpected directions and that offers a readable tale that rarely pauses for breath. There’s always value in reading about a way of life and culture that you know nothing about. Growing up in Ohio, I knew the Amish only as a mysterious and secretive group that lived out in the hinterlands – “Amish Country” we called it in Cleveland. As a child, it seemed a million miles away, both physically and philosophically. As an adult, you can get there inside of 30 minutes from where I grew up, and I no longer find religious extremism mysterious. Ira Wagler is a fine and talented writer who brings the Amish family and community where he was raised to life in a very accessible way. It’s engrossing to read about the rituals of life and courtship, school and work, from a perspective that seems American but oddly distinct. It’s hardly a surprise – stripped of cultural touchstones, there’s a richness of experience to explore but also a chilling alienation. Wagler’s older brothers chart his course early when they vanish into the night, an apparently not-uncommon occurrence in Amish families. Boys, eager to dispense with family drama, slip away when everyone else has gone to bed to flee the grueling work schedule and lack of opportunity. There’s just one course available – marriage, farm work and family. Ok, there are more – you can repair buggies or do something else that helps other Amish families live their lives without the benefit of technology, but let’s face it – it’s an automatic limit that boys and girls must accept. Let's not even mention the unbearable isolation this must create for LGBT Amish people. Wagler doesn't, and it seems a blaring omission. Wagler’s conflict eventually ensnares a young Amish girl who accepts his courtship and gladly agrees to marry him, only to make his final break with the Amish way of life more poignant, since the girl was committed to her family and community. It would be easy to condemn him for the way he uses this girl to test his own faith, but he was still just young enough to let him escape with only our regret, not our disgust with this somewhat underhanded method. Even at the time of writing this memoir, he doesn’t seem to be aware that this is a possibility, but lack of self-awareness is a common human failing of which we are all guilty. I recommend this book to anyone interested in learning more about the Amish.